Water Tank, Denver Hill | Heritage Bn. 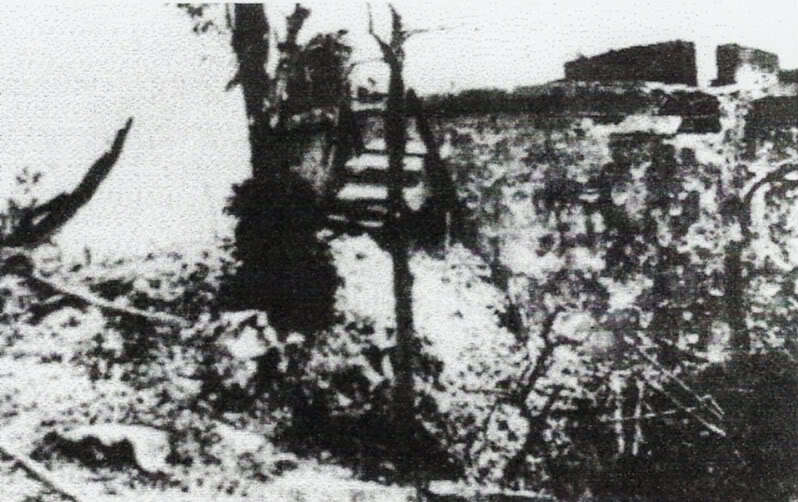 This Japanese photo, according to most references I've found, was taken during the assault on Corregidor, May 6, 1942. 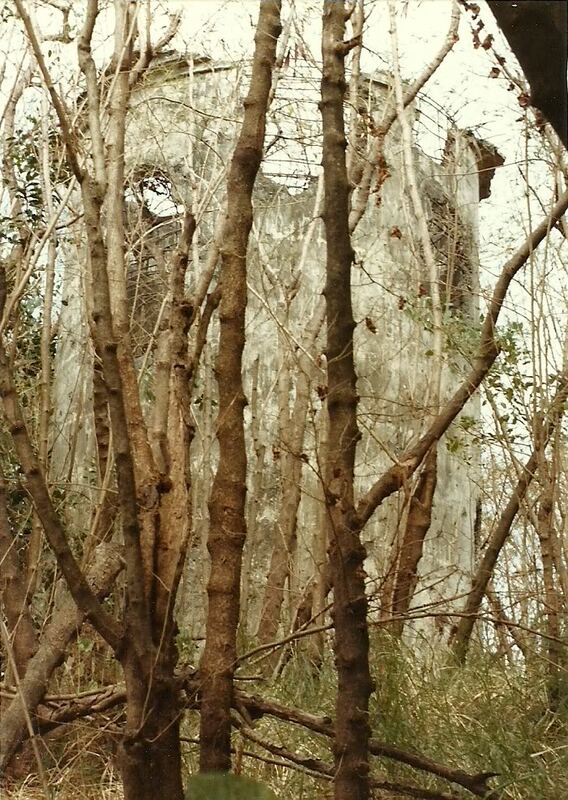 One source claimed the photo was taken on Bataan. John Whitman, in "Bataan, Our Last Ditch", briefly mentions the Japanese used flamethrowers a few times in that campaign. That was news to me. I don't recall reading about Japanese flamethrowers in any other histories or personal accounts about Bataan or Corregidor. 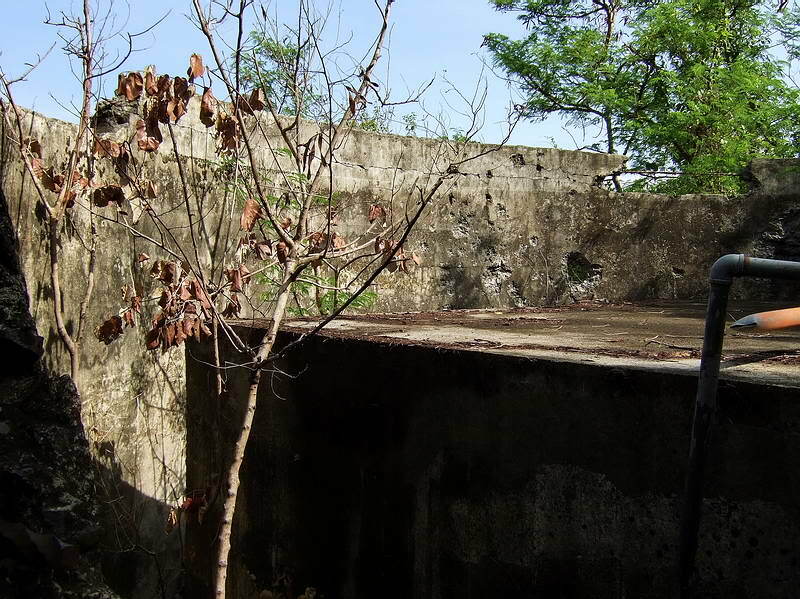 If this photo was taken on Corregidor, the concrete structure that the Japanese troops are assaulting looks similar to the "short" water tank on Denver Hill, which was the scene of fierce fighting May 5-6. 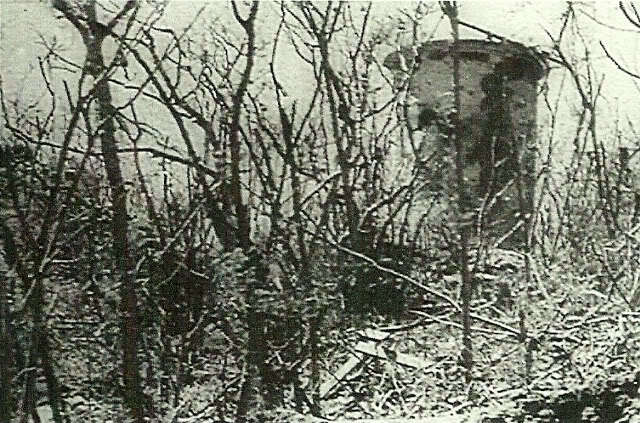 Here is a Japanese post-battle photo of the water tank on Denver Hill. In both photos, note the rectangular part on the top. What may be a wrecked ladder or stand leans against the tank. Here is a 1986 photo I took of the water tank on Denver Hill. Note the damage to the top, partially covered by the leaves. The first photo above also seems to show damage, to the right of the flame. Here's a 1926 photo of a similar tank (BLDG 601 TANK 6. Could it be the same one?). 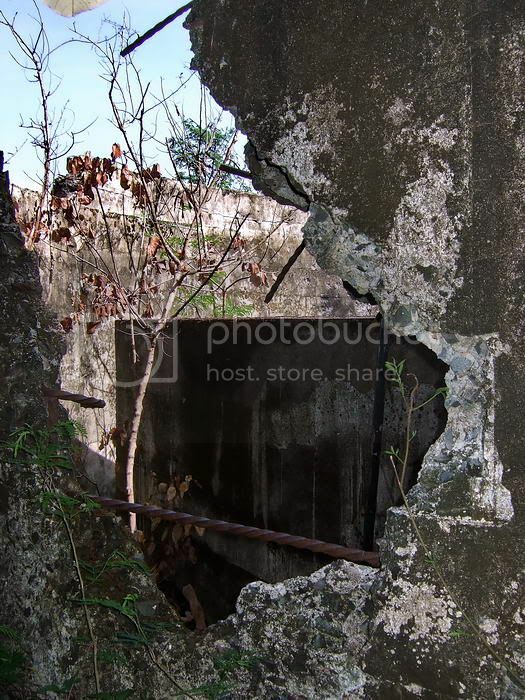 Note the overflow slot near the top (photo from corregidor.org). Here's an interior view I took of the Denver Hill tank in 1986. Note the concrete "ceiling" that is above the overflow slot. The sergeants must have stood on this during the 1942 battle (see narrative at end). Here are 2007 photos of the tank. 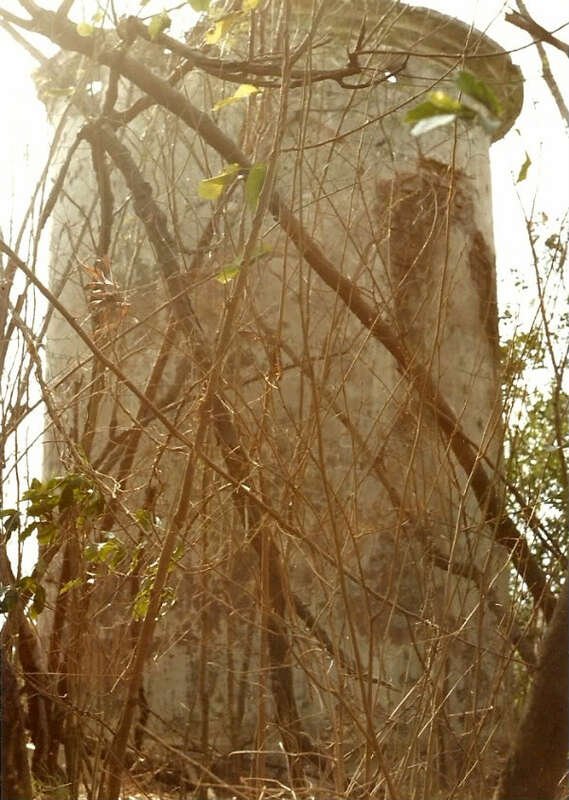 Note the damage to the top. (courtesy fots photos). 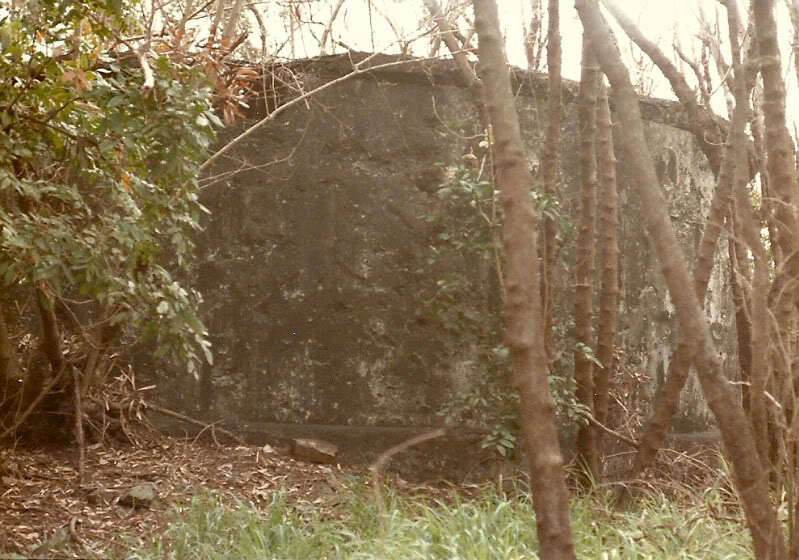 According to Senior Archivist J. Micheal Miller of the Marine Corps Research Center at Quantico, Virginia, on the night of 5-6 May USMC Sergeant Major John Sweeney and Sergeant John Haskin destroyed a Japanese machine gun nest at the base of this water tank using grenades. They then climbed to the top where they hurled more grenades at the Japanese infantry below. Haskin was killed while re-climbing the tank with additional grenades, and Sweeney was killed on the top. I've read that Sweeney's remains were not found and recovered until 1946. According to the Belote brothers in "Corregidor, Saga of a Fortress", the colorful Army First Sergeant Dewey Brady of Battery Denver was also KIA on top of this tank, on 24 April by schrapnel from a 240mm shell (page 120 and 166). Dewey did not know that he had earned a battlefield commission and been promoted to Second Lieutenant that morning. Hey Chad....That structure in the flame thrower photo certainly could be one of the water tanks (or a Maginot Line pillbox, but we can eliminate that possibility). Seems that I have read (again, I can't remember where) that a few flame throwers(not used) were present when the first Japanese troops cautiously entered Malinta. Have you ever heard that story?? The trouble with so many of these purported enemy combat film/photos is that they were re-enactments. There is just something about this pic that seems kinda "stilted" or staged. Maybe its because these troops are so evenly spaced and their heads seem to be sticking up a bit higher than you would think with Amer/Fil lead flying about. Flamthrower personnel, of any Army, always drew extra fire. Just my humble. This lastest presentation of yours is, as usual, thought provoking and up to "snuff". Keep the pipe line full. Cheers. BLDG 601, Tank 6 is the fresh water tank on Denver Hill. It is the shorter one you think it is, good photo. (The taller tank that was slightly west of 601 held Salt water and was designated as BLDG 642). Here are two photos of it taken in August this year. (I was wandering around looking for “grenade rings” but it started to rain so I left. I’ll try again in the dry season when the grasses have died down a bit more). One of the water tanks (Salt Water) is now long gone. Thanks to the construction of the park beside it. I remember the late Bill Delich, a Corregidor survivor telling me that builders of the park have no idea of the significance of the water tower and it was where a real fight was happening between troops from both sides. The distinction of the two tanks is the top cover. 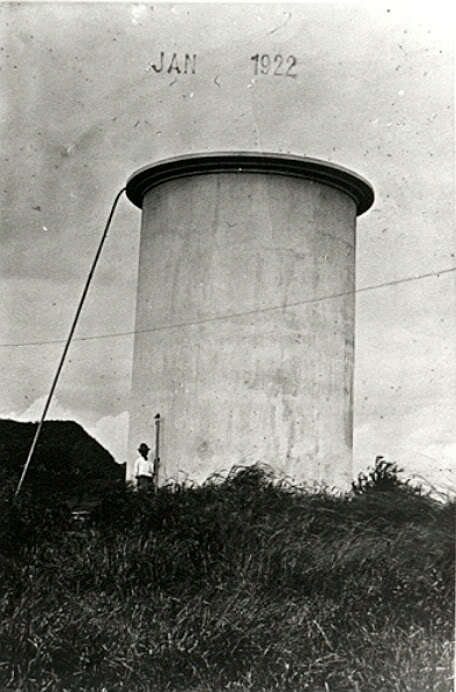 Salt water tanks usually look like reversed "tall hats" (concrete lip extended) while the fresh water tank was more cylindrical (like the photo above). 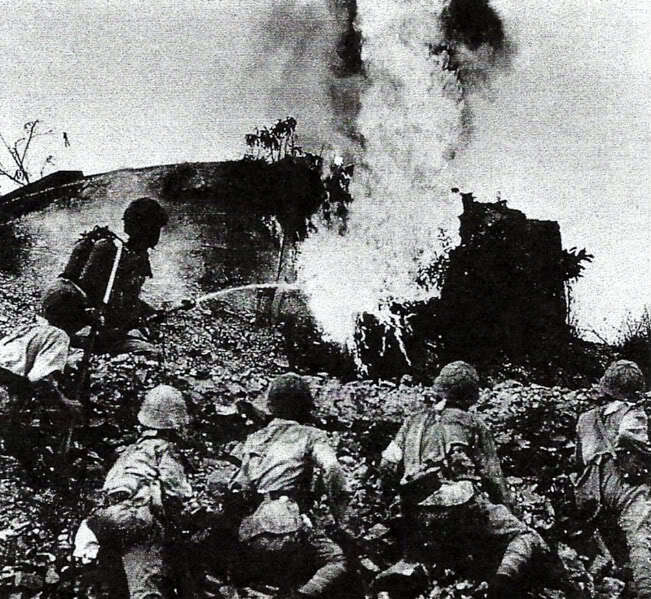 The Japanese flamethrower photo is a staged shot for the propaganda. 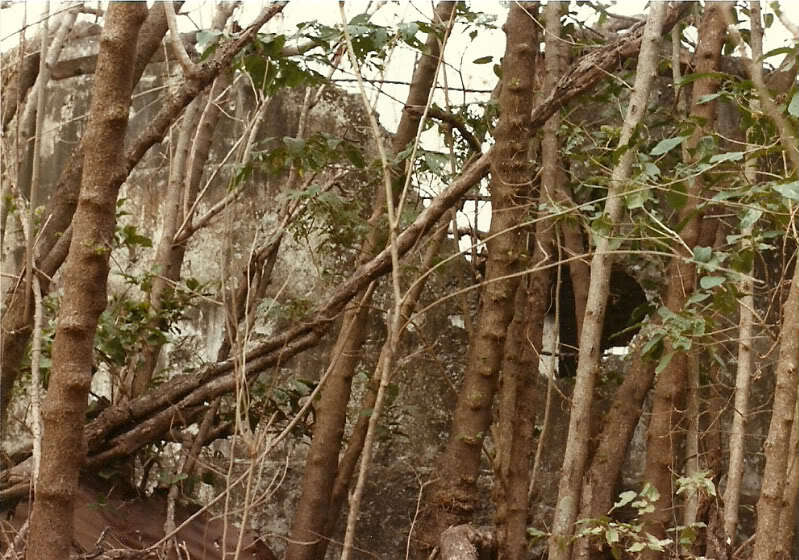 It was taken after the island has surrendered. Batteryboy, those are great photos. Is that the eastern slope of Malinta Hill in the background of the 1922 picture of the "tall" tank? I'm not surprised that the flamethrower photo would have been staged, like others were. As Okla pointed out, those Japanese troops are posed very conveniently for a photo shot. From the pictures you and Fots posted on top of the short tank, it looks like the "roof" has gone since I was there in 1986. Some of the roof was still there then, as was the metal ladder seen in the 1926 photo. You mentioned looking for grenade rings, and I have a story about that. At that time (1986), I mistakenly thought that Sergeants Sweeney and Haskin had thrown grenades from the top of the "tall" water tank. I tried to climb it, but it became dangerous and I was unable to get to the top. So I climbed up on the "short" tank instead. While I was on top of the short tank I saw several small roundish pieces of wire that were mixed in with some rubbish. I remember wondering if they could possibly be pull-rings from Sweeney and Haskin's grenades but decided that could not be, because I was on top of the "wrong" tank. Years later I learned that the sergeants had been on the short water tank instead, and ever since then I have wondered if those pieces of wire were the pull-rings from their grenades. I left them there, so even if the roof has totally caved in they may still be inside the bottom of the tank. Great shot of the salt water tank. You are very lucky to have explored it and to be honest, it is the only modern day photo that I have seen of it. The Japanese also did a propadanda movie about it but this time it was them on top of the water tower and they threw the grenades against the defenders. I dont have a clear account of the last fights between the troops from both sides just before the surrender. 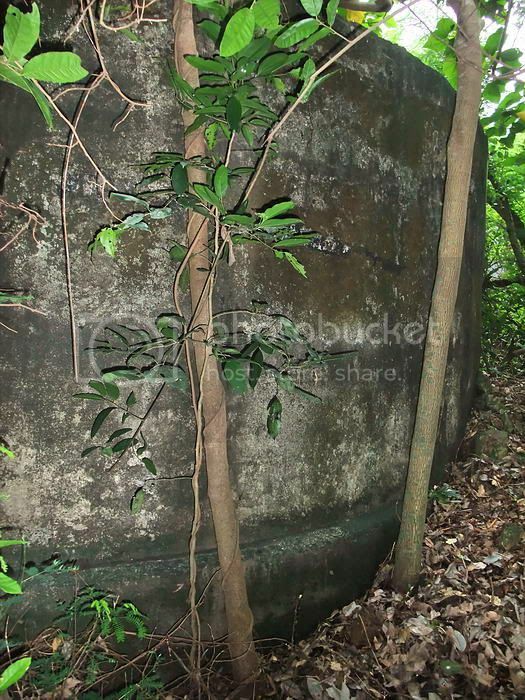 There were conflicting stories that I have come across about the battle of water tank hill. Nevertheless, Haskins and Sweeney deserve to be in the hall of heroes if you ask me. That is very interesting, Batteryboy. If the Japanese made a propaganda movie using the salt water (tall) tank with their troops throwing grenades, then that makes me wonder if the tall tank was actually the one the USMC sergeants threw grenades from, notwithstanding my find of possible pull rings on top of the short tank. Wouldn't the Japanese have known which one it happened on? But then maybe the taller tank was more impressive for the camera, or the top of the short tank was damaged too much for stage acting. I wonder if the body recovery reports stated which tower Sweeny's remains were found on. 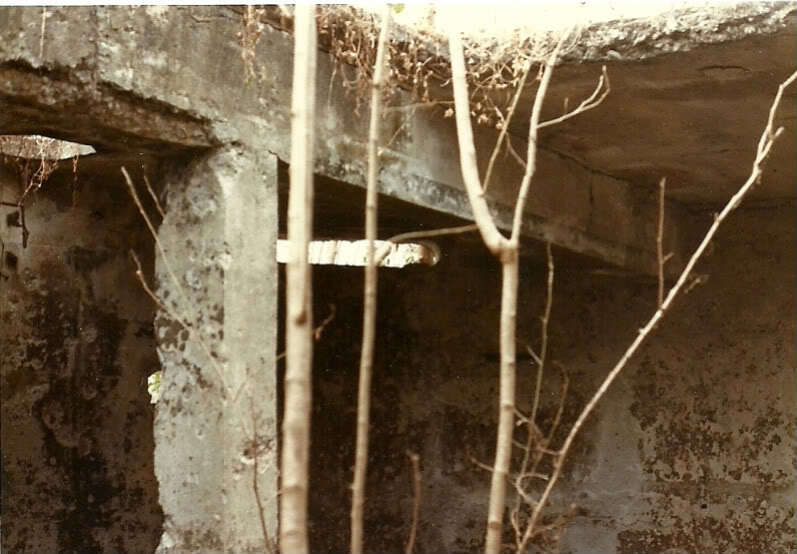 Miller, in a photo caption for his 1997 USMC monograph "From Shanghai to Corregidor: Marines in the Defense of the Philippines", said that the short tank was where Sweeney and Haskin were killed. That photo (the second one at the top, which, BTW, I have also seen elsewhere) was supplied by the Japanese 61st Infantry Association, and I suspect that his conclusion may have been based on information they might have provided. His monograph has by far the best US account I have read of the Water Tank Hill fight. Unfortunately, I have not seen any Japanese or Filipino accounts. 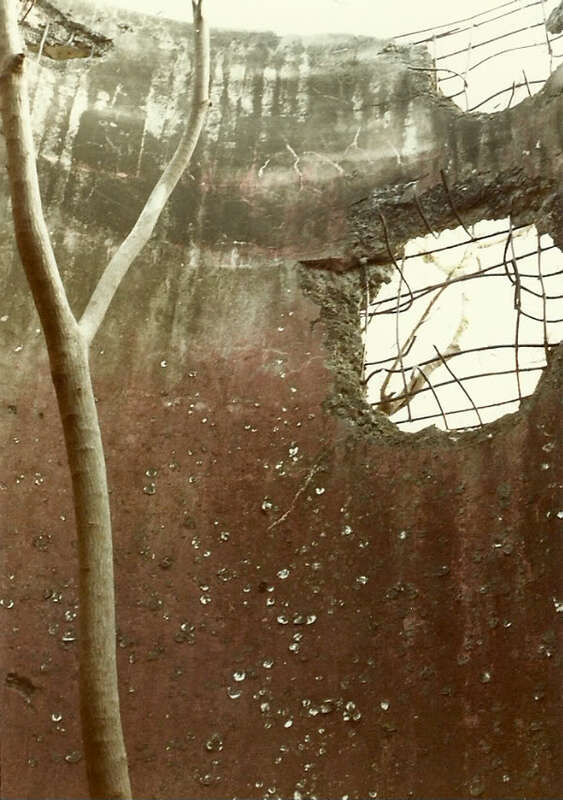 P.S.- A close look at the February 1945 photo of Water Tank Hill reveals a shell hole in the top right of the tall tank, which is shown on the 1986 photo taken from inside. I am not certain what water tower did they use in the propaganda film but they were inspired by the actions of Haskins and Sweeney. When Lt Lawrence and his men surrendered, they were treated fairly well as the Japanese respected them for their fighting abilities and for inflicting so much casualties during their landing. Fots, thank you for verifying that the B&W photo I posted of the fresh water ("short") tank was indeed the one on Denver Hill. I'm sorry I overlooked that the last two color posts were yours- one of my "senior moments", I guess (alright Okla, nothing meant there ;D). Is it possible you might know approximately how far the fresh water tank was from the salt water tank? Would they be, say, a grenade's throw distance apart? Here's why I ask. I've just finished reading the late USMC Sergeant Otis King's account of the Water Tank Hill battle in his privately published 1999 book, "Alamo of the Pacific". Generous with text and maps, it rivals Miller's account in detail. Although King manned a machine gun at Battery Point with the 3rd Batallion, 4th Marines and apparently did not participate directly in the WTH fight, he of course had many personal contacts and references at his disposal. According to King, at about 0345 on May 6 Sweeney and Haskin began their grenade assault on the Japanese machine gun, which was inside the dried out water TANK firing through a hole in the concrete wall, "below the water TOWER". (Capitaization is mine). The two men climbed to the top of the tower "and lobbed hand grenades down into the water tank below, silencing the machine gun". He then recounts their deaths in the same way as others, except that they perished on the "tower". So, that makes me wonder about how far apart the fresh and salt water tanks were. It seems they were a fair distance from each other, if I remember right. Most accounts, including Miller's, seem to loosely exchange the words "tank" and "tower", creating some confusion. Miller, for example, says that the "Japanese machine gun was placed in a hole in the base of one of the water tanks", says S & H climbed up the "water tower", and captions his photo with "these two water tanks" while identifying the short one as the tank they died on. Maybe the darkness caused confusion in the minds of the few survivors historians relied on, men who certainly had many other serious things happening around them, and to them. So, another question comes to mind, Fots. Did you happen to notice a hole in the wall near the bottom of the fresh water tank that a machine gun could have fired through? From the 1936 map, the distance between the two water tanks is 260 feet. There is at least one hole in the tank wall. Honestly I was not looking for holes, there may be more. If I remember correctly it is in the south side and about 3ft above the ground. The Japanese could have supported the machine gun on something to fire out of there. Here is a photo of the hole. Hey Guys....This is, as usual, good provacative stuff. These "little" Corregidor "riddles" and mysteries are never ending. I, for one, am tickled to death about that. Cheers. Fots, that kind of looks like this hole, which I found in the tank in 1986. Looking at the very bottom right of the hole, a trace of light can be seen through the other side of the tank. Maybe it is blocked out by that large concrete (?) block in your photo. Thank you for taking the time to check the distance between the water tanks. 260 feet...nearly 87 yards. That sounds like a long grenade throw, but then, they may have been on top of the tall tank, which would help. Still, to throw accurately that far at night, and to the inside of the short tank, which still had some of its roof left to block a grenade, makes me wonder. But stranger things have happened. 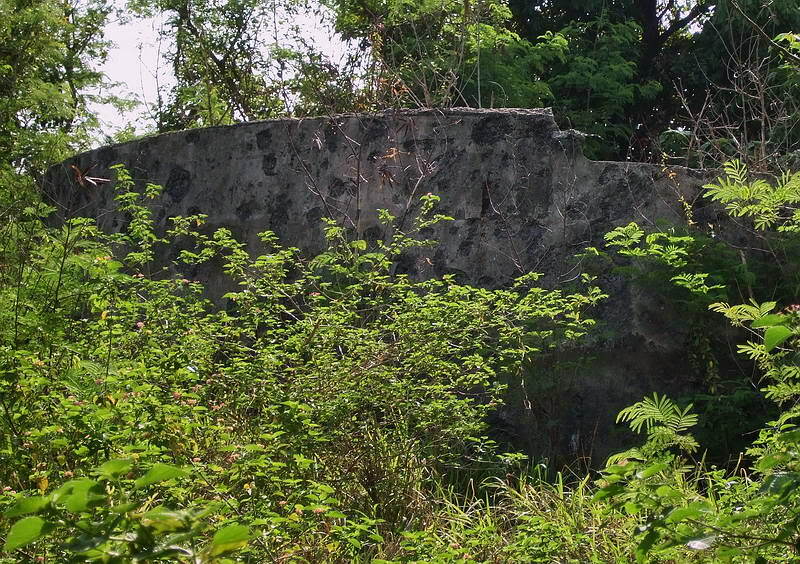 Okla, yes it could be another one of those little Corregidor mysteries. Even stranger, I have come across a couple of accounts that seem to say there were two short tanks on Denver Hill, in addition to the tall tower. Looking above at the B&W February 1945 Water Tank Hill photo, I see a dark object behind and to the left of the tower. Can't say for sure if it's a water tank, but it doesn't strike me as looking like the stubby short tank I saw in '86. 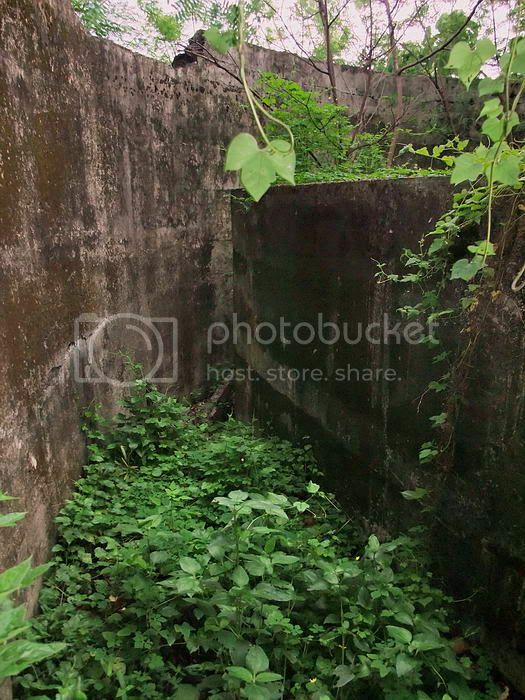 That large block in my photo is a metal tank inside the old destroyed concrete tank. I see no other tanks on the 1936 map but they had more than five years (until 1942) for new construction that is not recorded. I don’t know of any other tanks in the area today. Fots, I wonder when the metal tank was installed. I'm not sure I remember it from the 1980s, but I sort of remember that pipe inside the water tank in one of your photos...must be the "over-fifty" syndrome, I guess. I kind of bite my lip posting this 1986 photo, because it's such poor quality. This is the other side of the tall tank (salt water). The growth was so dense it was impossible to hack it all down with my bolo if I wanted to have time to see anything else that day. Only because the famous tank is gone forever and there seems to be almost no recent time pictures of it would I post this. I've watched a couple of 1942 Japanese newsreels that had brief glimpses of Water Tank Hill. What struck me was that the Japanese took pictures of only the tall (salt water) tank. The short (fresh water) tank was not shown at all. There was no hand-grenade reenacting in these particular newsreels, just short, panning views as the narrator spoke Japanese in the background. It was evident that the footage was taken shortly after the battle, because other segments showed U.S. POWs walking around Malinta Tunnel and finally ending up in the 92nd Garage Area. One narrated scene that showed the tall tank lasted about 20 seconds. Although I don't speak Japanese, I couldn't help but wonder why the narrator would focus on one tank only, and not the other. Maybe he figured the height would be more impressive to a Japanese audience. But the thought struck me that surviving Japanese soldiers may have led him to believe that more of the fighting occurred at the tall tank. The tank that was bulldozed in recent years. Salt water tank, Water Tank Hill. Post-battle, 1942. 63. Sobert Richard Nuest, Ens., USNR, Swore on May 22, 1943, that George L. Cook, SF2c, USN, while a prisoner of war at the 92d Garage, Corregidor Island, PI, was sent out of the prison area on a wood gathering detail and that this occurred on May 17, 1942; that while in the vicinity of the water tower in the eastern sectar of Corregidor Island Cook picked up a hand grenade which exploded, killing him instantly; that his body was brought to the 92d Garage and identified by Richard Enoch Tirk, Ens., USNR, that the foregoing facts were related to me by Ens. Kirk and that I believe them to be true. Even if it is not the same water tower, it is consistent with there having been a grenade battle in the area and may be indicative of the amount of duds. Sad, though that someone would survive such fighting only to die from XO. Johneakin, by chance have you seen any death records on USMC Sergeants John H. Sweeny or John E. Haskin, the two marines who were killed throwing grenades from one of the water tanks? Sweeney died on top of a tank, and Haskin died while climbing the tank to resupply his friend with grenades. According to one account Sweeney's body was not found and recovered until 1946. I've wondered if any surviving records would say which tank his remains were found on. Also, I see again that the words "water tower", rather than "water tank", were used. On a hill where there are two tanks, one tall and one short, it strikes me that "tower" would apply to the taller structure. The short tank has never seemed like a "tower" to me. It's easier to see how Sergeant Sweeney's remains may have gone undetected until after the war if they were on top of the tall tank. It's occurred to me that Sweeney and Haskin may have climbed and thrown grenades from both water tanks that night. In all the frantic confusion it appears that some territory on the hill changed hands back and forth several times. 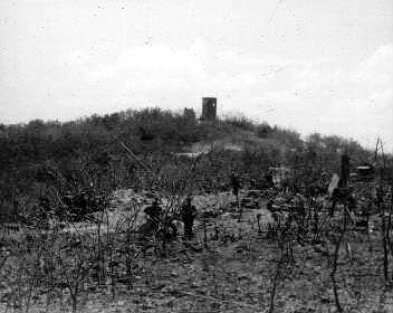 During the engagement with the enemy in the vicinity of Kindley Field following the hostile landing on Ft Mills, and at about 0200 6 May 1942 I observed Capt Noel D. Castle, C.O., Co D, 1st Bn, 4th Rgr, walking the Malinta Point trail at _ towards the north side of the road. 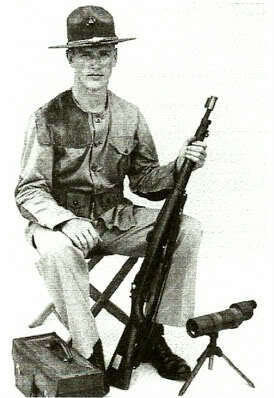 PFC Edward G. Free, USMC and I were manning a machine gun about 20 yards away. Upon recognizing Capt. Castle I called out, “Go back, there is a sniper shooting this way”. Without stopping Capt. Castle continued on. About a yard from the enbankment on the north side of the road he was hit by what I believe to be rifle or machine gun bullets. I saw him fall forward and disappear from sight over the edge of the road. Shortly after this the enemy opened up with an artillery concentration from Bataan and Free and I were forced to take cover. I jumped into a nearby hole and Free ran across the road into the draw where Capt Castle lay. The concentration lasted maybe ten or fifteen minutes after which each of us returned to our gun. Free then told me that Capt. Castle was hit in the chest and abdomen and was in a bad way. He told me that the Captain could not move and that he had loosened his pistol belt and other equipment. We then moved our gun to a new position and continued in the fight. I did not see Capt. Castle after he fell over the edge of the road. That's very interesting, Johneakin. I had not read such a detailed account of his demise before. Captain Castle was also involved in much of the fighting at the Denver gun pits and water tanks. Thank you for providing that account, the records of what happened in the area that night are so sparse. Please keep us posted on your fascinating research.